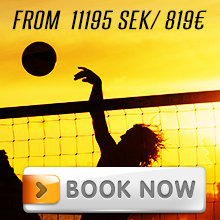 LEARN HOW TO PLAY BEACHVOLLEY ON THE MOST BEAUTIFUL BEACH IN EUROPE! Don’t miss this unique opportunity to learn how to play REAL beach volleyball! Our professional instructors will teach you the best techniques as well as Beach Travels’ winning playing concept that make you a much better player. Many of our participants have never played before, EVERYONE is welcome to learn to play the world’s funniest sport! It does not matter how much or well you’ve played before you arrive in Praia da Rocha, our instructors accommodate the practices to the level of each participant. We promise you will leave Portugal as a much better player with loads of new knowledge, a fantastic week on Europe’s best beach and a crowd of new beach volley friends! Join BeachTravels on your own or with a group. Besides beach volley we have a load of other exciting activities lined up during the week to maximize your stay on Europe’s best beach (awarded Europe’s leading beach destination by the World Travel Awards 2016). We offer yoga 4 times a week, after beach with a DJ every afternoon at our snug beach lounge, a beach gym, tournaments every day, the opportunity to join a surfing road trip, mid-week pool party and much more! In the past 6 years more than 2700 players have participated in our start course, a course where the training concept is developed by the world’s leading beach volleyball coaches. Pump it up with the best training as well as with cool awesome beach hang, the most luxurious hotel and the outstanding beautiful beach… Come along with BeachTravels to Praia da Rocha 2019!